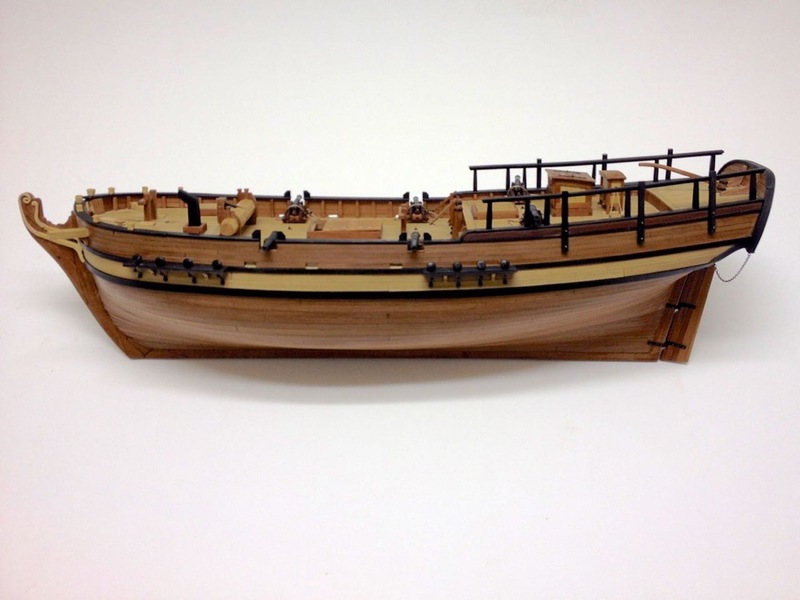 A commissioned project to build a kit-bashed version of the colonial schooner Independence by Artesania Latina. It occurred to me that I haven’t been posting enough about my own traditional western-style model ships what with my Japanese boat models and now the Japanese shrine build. Also, as I’d been in something of a slump due to project overload, I thought it might help me move forward by writing some more project updates. 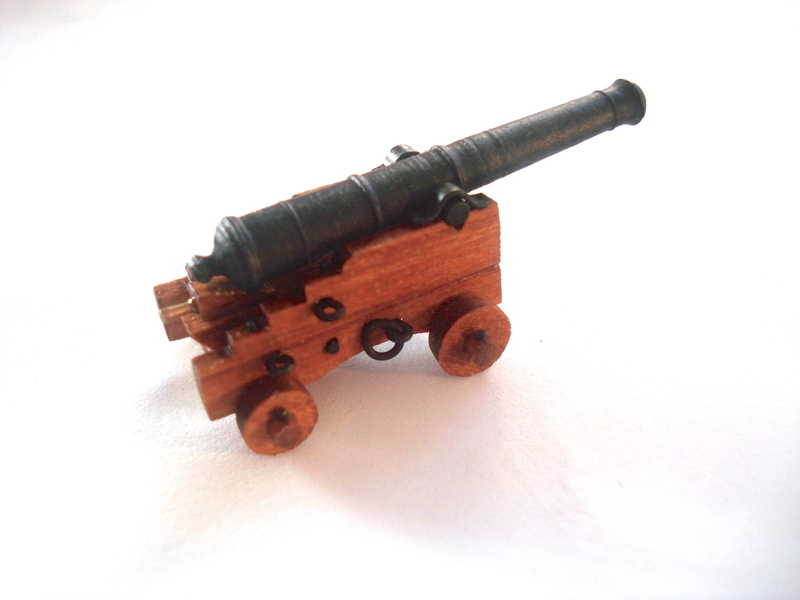 Though I’ve written plenty about the cannons on my model, I don’t think I’ve said anything about the swivel guns. Clearly, I’ve replaced everything else from the original kit, and the swivel guns are no exception. I’ve being going back and forth on the scale of this model, and for the person I’m building this for, I don’t think the exact scale really matters. 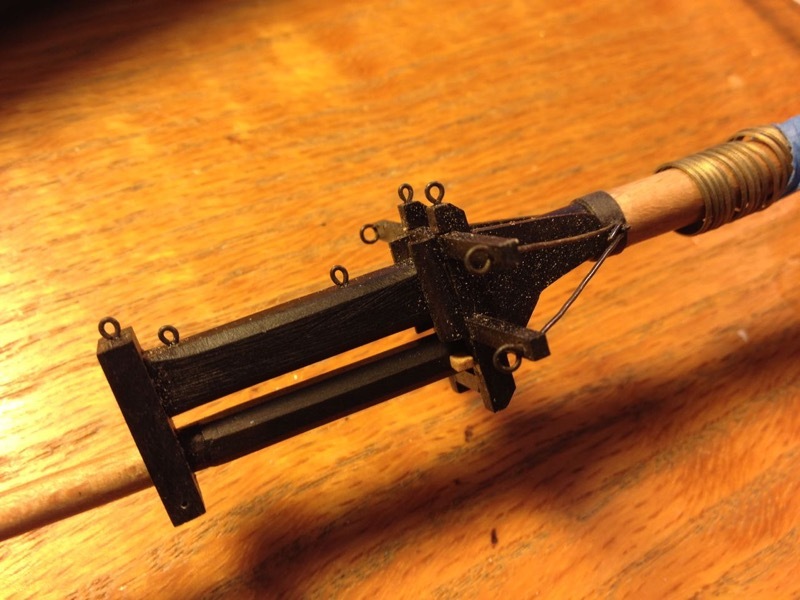 For the swivel guns, I ended up going with the 1/48-scale turned brass swivel guns sold by Syren Ship Model Company. 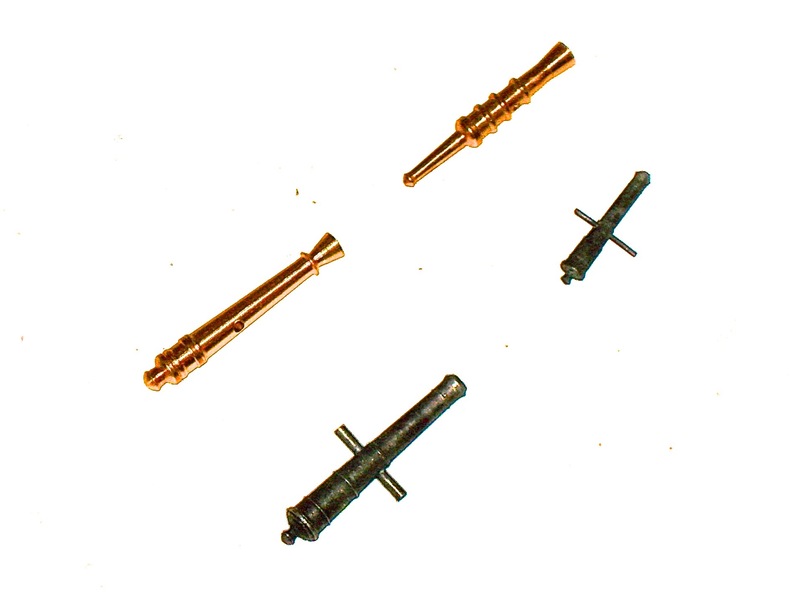 AL kit barrels in brass. Lumberyard replacements in pewter. This entry was posted in AL's Independence Build, Ship Model Build Logs, Ship Modeling News and tagged Artesania Latina, cannons, Colonial Schooner, Independence, Ship Model, Swivel Guns, syren ship model company on April 30, 2017 by catopower. I’ve been working on this model for a long time now, and recently, I’ve been trying to focus on finishing her up. I don’t have too much to say about the model at this stage, except that it’s a lot easier to follow someone else’s rigging plan than trying to work it out from scratch, or even modifying someone else’s plan. Colonial Schooner Independence nearly complete. Apologies for the ad hoc backdrop that needs ironing. 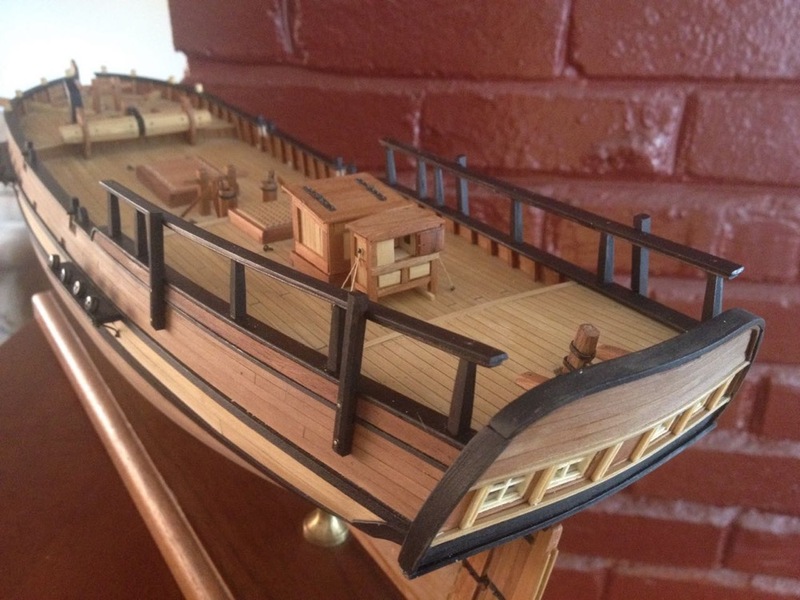 This entry was posted in AL's Independence Build, Ship Model Build Logs and tagged Artesania Latina, Colonial Schooner, Independence, Rigging, Ship Model on March 23, 2017 by catopower. Yes, I’m finally getting around to wrapping up the Colonial Schooner Independence. I’ve worked on it here and there, but hadn’t made any blog posts about in quite some time. The last task that I was concerned about was to construct some headrails from scratch. Mostly, this is one of those tasks which is painful, because the brain says it’s painful. In actuality, it wasn’t that bad, but did take some mental work to wrap my head around where to even begin. 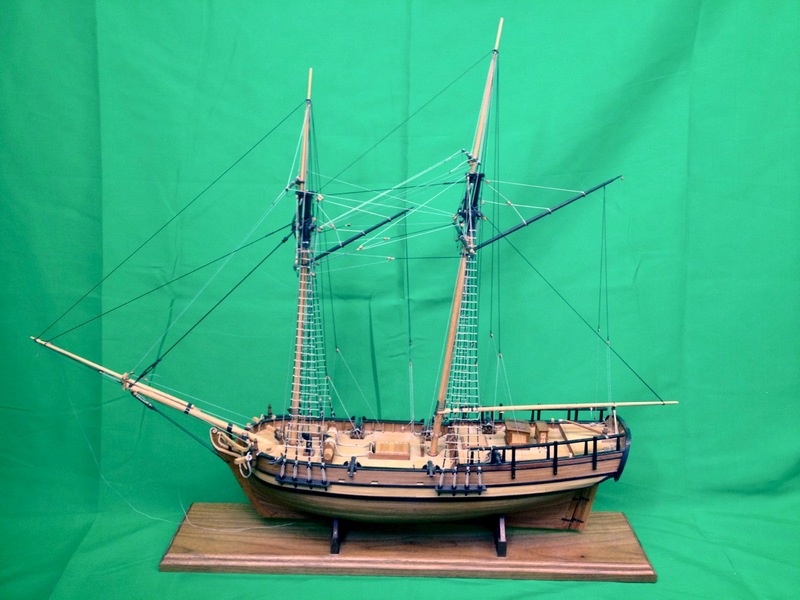 This entry was posted in AL's Independence Build, Ship Model Build Logs and tagged Artesania Latina, Colonial Schooner, Independence, Rigging, Ship Model Kit on February 19, 2017 by catopower. Well, it’s time to put more energy into finishing my Colonial Schooner Independence. As I mentioned in my post about repairing a model of the Santa Maria, I had a bit of an accident a couple months back. I was putting the Santa Maria back on the top of one of a pair of free-standing bookcases. I was trying to avoid some things on the floor and lost my balance and went crashing into the book case. I made a great effort to protect everything, but did end up with a little damage on the Santa Maria model. But, when I looked up to check on the book case, I discovered the Colonial Schooner model, which had been sitting on top, was gone. It had been knocked over the other side of the shelf and landed on a cardboard box about 2-1/2′ down. I was afraid to even look for damage right away, but over the following week looked at it bit by bit. Amazingly the damage to the model was minimal. The deadeyes on the main channel needed some tweeking and the jib boom was knocked loose. The worst damage was the bowsprit cap, which broke, but that was about it. An amazing story of survival! Now, most of the damage has been repaired and the model cleaned up and ready for progress. I rigged the guns, which required me to prepare some more blocks. For the gun tackle, I ended up staining some of my supply of Warner Woods blocks. I am using Syren Ship Model Company’s pear wood blocks for the rest of the model, but the available sizes were either too small or too large. The Warner blocks were available in the right size, so I used those. While the styles are different between Warner and Syren, for the small size I needed, no one will ever notice. I decided to keep things simple and wire strop the blocks with necessary beckets and hooks. For rigging line, I had been debating over using right-hand laid “Morope” or left-hand laid rope from Syren Ship Model Company. I don’t like the backwards lay of the Syren line, but the quality of the line is outstanding. Also, it’s properly turned, so it doesn’t immediately unravel when you cut it. Finally, the line is not stiff or springy and is just a joy to work with. Finally, the color of the tan line I was using was nicer than the gray color of the Morope beige line, at least for this model. I paired up blocks and tied off lines to beckets and ran the line through the blocks, then glued the rope into coils before rigging all the carriages. With the carriages pinned in place with brass rod, it was nice to not having the guns knocking about or to worry about failing glue joints. 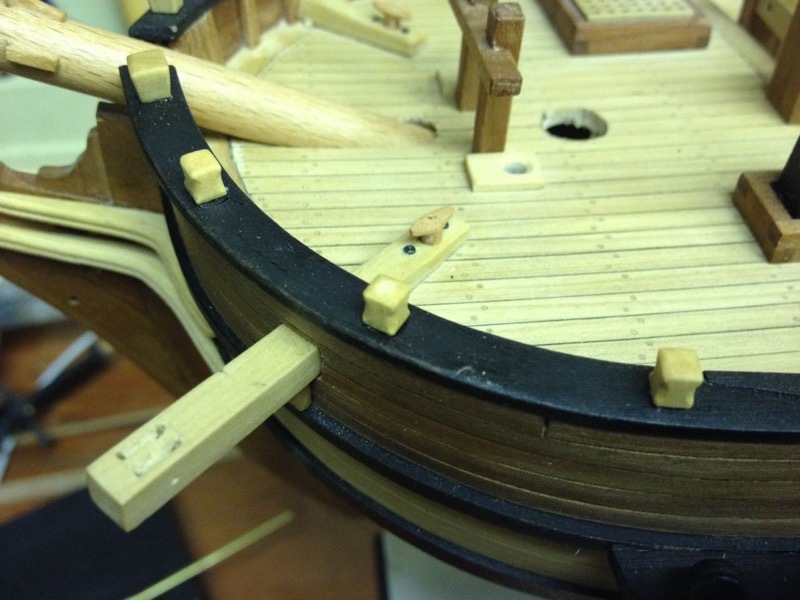 After hooking blocks into place on the bulwarks and gun carriages, I use a little CA to lock them into place, then I used a little white glue to secure the rope coils to the deck. Today and last night, I worked on getting caught up a bit on this project. So, in addition to rigging the guns, I also mass produced some stops from swiss pear, added them to the gaffs, and died them black. Knowing I’d be needing cleats, I went ahead and cut a strip of swiss pear to size and started fashioning some 1/4″ long cleats. The first of these cleats went onto the underside of the main boom. I also started stropping some blocks to use for the vangs. While I used wire to strop the gun tackle blocks, I’m rope stropping all other blocks, including these. For the needed beckets, I used a pin for form them. The line I used to sieze the eyes of the beckets was tan thread just for artistic contrast. These will need hooks on the other end, so I went into hook production today as well, using 26 gauge black annealed steel wire. In the process of forming the loops and hooks, some of the wire gets pretty bright colored. So, afterwards, I used Caswell Stainless Steel Blackener, which seemed to work just fine on this regular steel. Next, I’m working on repairing the bowsprit cap. I cut a piece of beech wood to the right dimensions and now I’m in the process of making the square notch and the hole for the jib boom as close to the original as possible, so that everything will, hopefully, all fit together perfectly. This entry was posted in AL's Independence Build, Ship Model Build Logs, Ship Modeling News and tagged Artesania Latina, Colonial Schooner, Independence, Ship Model Kit on January 24, 2016 by catopower. And if you don’t celebrate American Independence, well, you can celebrate that I’m finally posting some information about my colonial schooner Independence build! The first item of major importance is the fact that I’ve finally added scrollwork to the beakhead. Not being too great at carving, I found an adequate substitute in the form of sculpted polymer clay – I used the brand called Sculpey. The clay was rolled very thin and shaped to fit the area of the beakhead. It was then baked in the oven according to the instructions, cooled and then glued into place. Baked Sculpey isn’t stiff unless you bake it too long. It retains a bit of pliability allowing you to bend it to fit. It can also be cut and carved to take away it’s natural roundness. The particular stuff I used was called Super Sculpey, which comes in many different colors and can be blended together as needed. I played around with a mix until I got something that was close to the color of the boxwood on the model. The next step at the bow will be to add the head rails, which doesn’t seem as daunting a task now that the scrollwork is done. Progress was also made at the stern of the ship with new moldings laid in between the gallery lights. To do this I used boxwood strips and made a new scraper, which I’ve learned is pretty easy to do. To make the scraper, I simply took an old single-edged razor blade and use a Dremel with a cut-off wheel inserted, then just ground out a rounded “W” shape in it. The sharp point in the middle cuts a nice line in the center of the molding as the rounded shape rounds-out the beads on either side. You can see the results below. As you can see, I also added the preventer chains on the rudder. These kind of hang low and I considered pinning them up under the counter so they wouldn’t hang down so far, but it would have limited rudder movement, so I decided to leave it alone. I completed the quarter gallery rails some time ago, but didn’t post a picture since then, so I’ll do that here. But, I’ve since also cleaned up the hull and given it a final coat of natural finish Watco Danish Wood Oil. This brings out the final color of the model. In particular, the accent strip of Peruvian walnut below the quarterdeck rail now show a nice contrast with the rest of the hull. From the above image, you can also see that the cannons are now fixed into place. I have yet to add the gun tackle, but the breech ropes have been added and the cannons are permanently fixed in place now. For the breech ropes, I had been planning to get my rope walk together by now, but I’m still looking for a few parts. My ropewalk is based on plans drawn up by ship modeler Jerry Blair maybe 10 years ago. I’ll write about that whole project at another time. In the meantime, I decided to go with quality model rope. I ordered a selection from Syren Ship Model Company and finally got around to ordering some European made Morope. I won’t go into a lot of detail on the two. Both are very nice. Syren’s product only comes in S-laid or left-handed twist. Morope is easiest to get in Z-laid or right-handed twist. 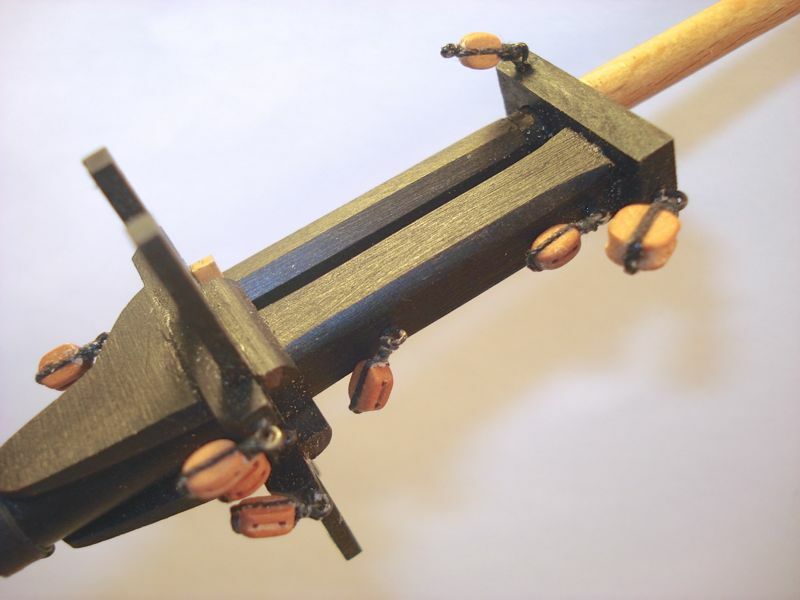 Though Morope is available with left-handed twist, the order form warns that it may not be in stock and can take a while to get. No matter, most rope is right-hand laid, so I decided to go with the Morope this time except where left-hand twist is called for. Hopefully, different types of material won’t be too much of a problem. Now, getting back to the cannon breech ropes, those are S-laid, so I used Syren’s rigging line for that and it looks really darned nice on the model. Real turned rope looks so much better than most of the stuff put out by the kit manufacturers. For the lashings at the end ends of the ropes, I decided to go for art over authenticity. 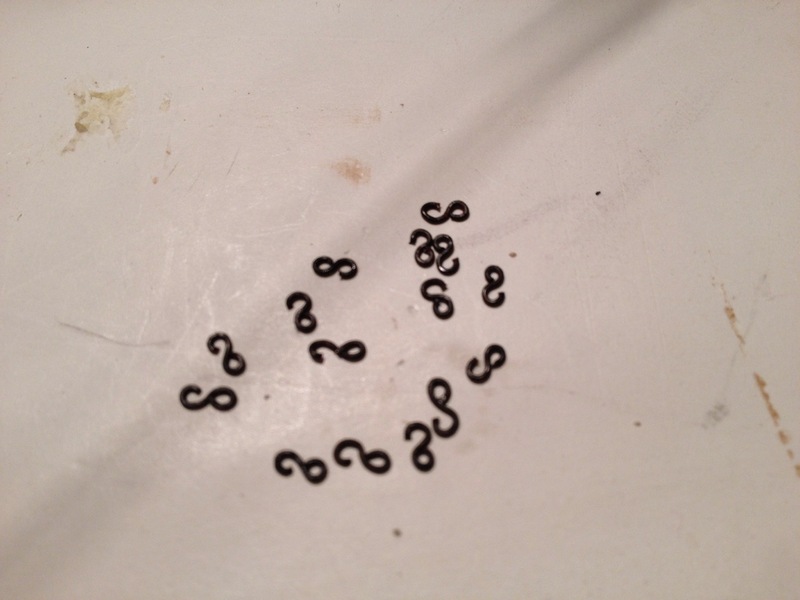 I chose to use thin black thread, which normally would represent tarred rope. That would have only been done if the lashings were intended to be permanent, which they were not. For this model, it just adds some visual accent. I was recently part of a discussing on tackle blocks for cannons. 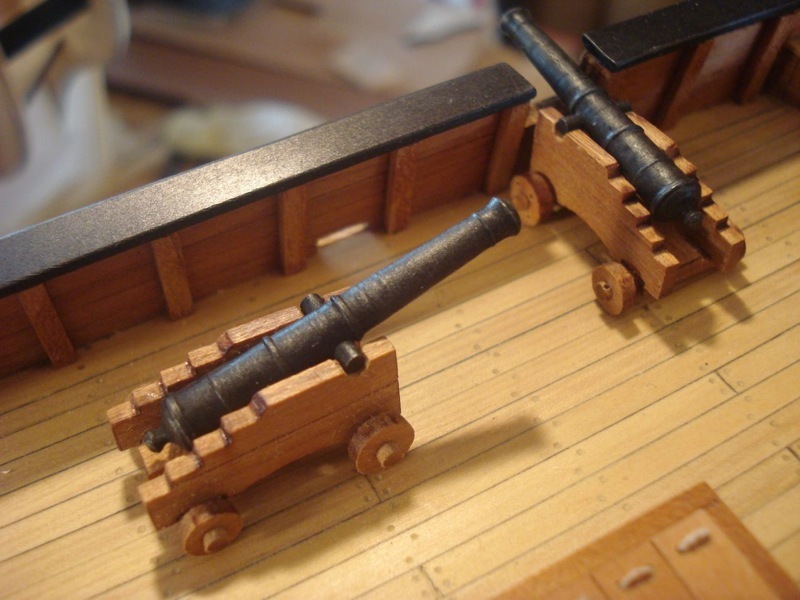 It seems that the number of sheaves in the blocks was dependent on the size of the cannon. Larger cannon might have a single block and a double block. But, the guns on the Independence are small, 4 pdrs, so they probably would have used a pair of single blocks for the tackles. 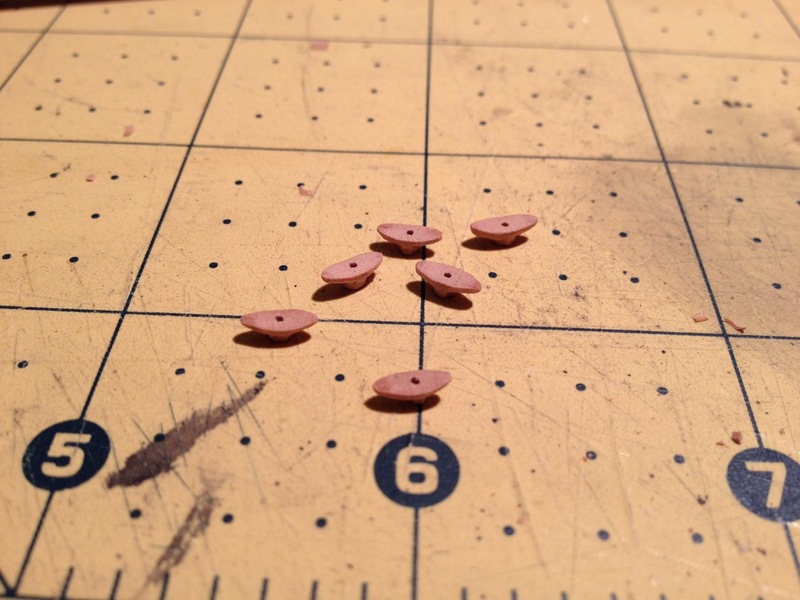 For that, I’m using Swiss pear blocks from Syren Ship Model Company (note that these are no longer offered for sale). More on this later. For now, I’ll end this with a side profile photo of the Independence as she looks now. 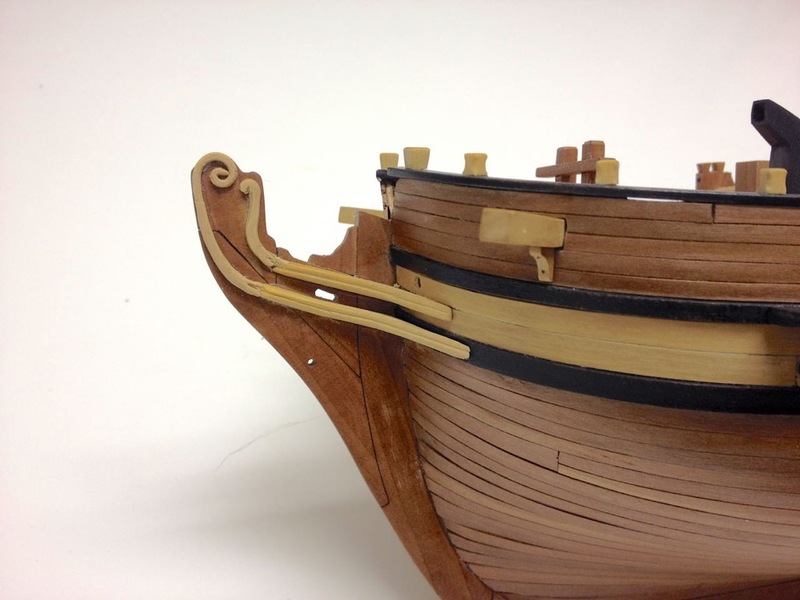 This entry was posted in AL's Independence Build, Ship Model Build Logs, Ship Modeling News and tagged Artesania Latina, Colonial Schooner, Independence, Ship Model Kit on July 4, 2015 by catopower. The biggest issue holding me back right now is what to do about the headrails and figurehead. I’m no carver, so I don’t foresee putting some grotesquely lumpy monstrosity below the bowsprit. I considered trying to dig up some existing figurine I could modify to put into place, but haven’t really come up with any good ideas for that. At least, not yet. 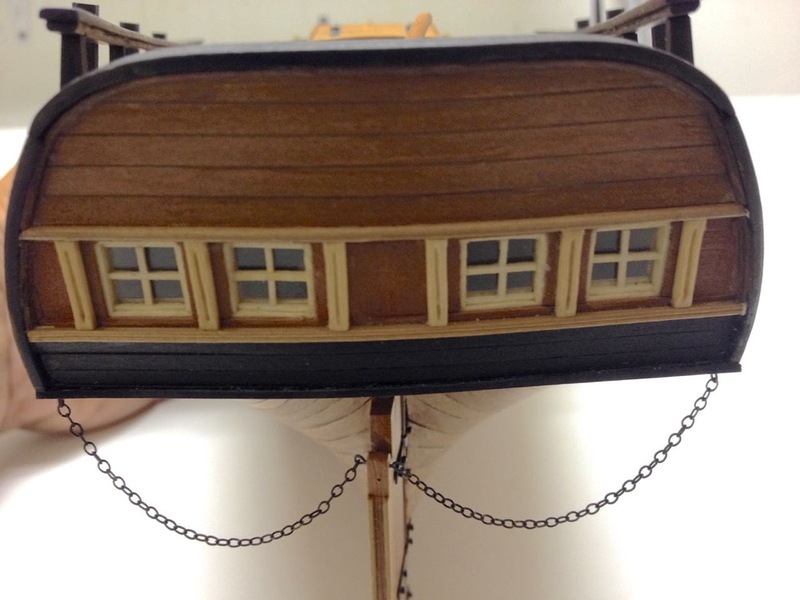 However, I did manage to add some more detail to the transom to make that more to my liking. I’ve shown this to others and most generally agree that the transom looks much better. Basically, all I did was to add some molded columns between the stern gallery lights using some boxwood strips. The added transom detail can be seen from the side in the above photo. 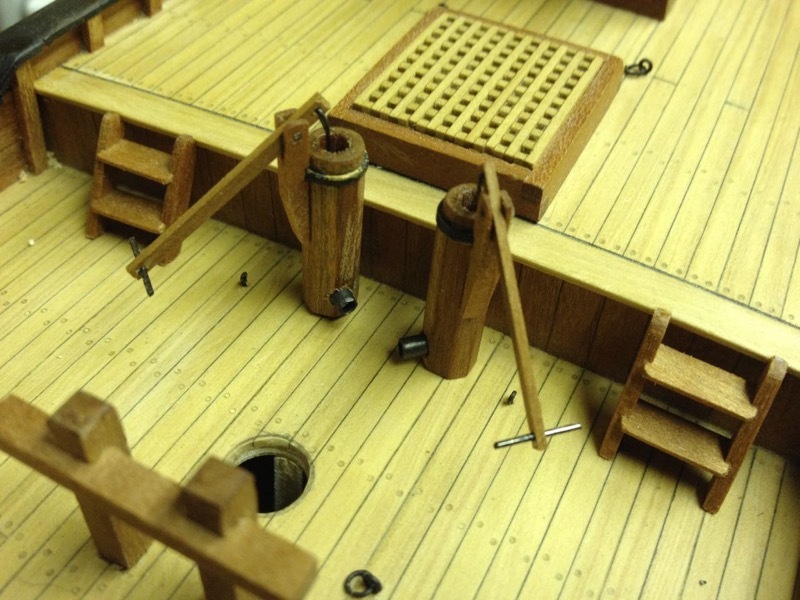 Also the next item to discuss, which is the quarterdeck railing. This was a mental challenge more than a physical one. Actually building it was far easier than thinking about building it. I basically did a paper tracing of the caprail along the quarterdeck and used that as a guide for the shaping of the rail. For the rail itself, I wanted a molded shape so that there was a lower portion slightly narrower than the upper portion. I achieved this simply by making out of two separate layers of wood. As I have been using pear wood throughout the build, it was easy enough to soak the wood and bend it to shape with the help of a little heat. I used my electric plank bender to steam the water in the strip and then gently shaped the piece by hand. I also used some plastic clamps that wouldn’t mar the existing work, and clamped the pieces right onto the bulwarks caprail until the pieces dried out, after which the two layers were glued together. As you may notice, the stanchions have a bit of shape to them. I didn’t have much I could think to do to make these except to shape them by hand, one-by-one. But, there’s only a dozen of them, so once I got started, it didn’t take long to finish. I made a few extra just in case. To mount these, I tried a method of simply marking the positions on the rail I just made, laid it down on top of the caprail and drilled them through so that the holes lined up. I’m not sure if I’d do this again because there was enough variation in positioning that the holes in the caprails weren’t perfectly centered. So, I had to end up re-drilling some. It wasn’t too much of a problem as the bottom of the stanchions were large enough to cover any small error. 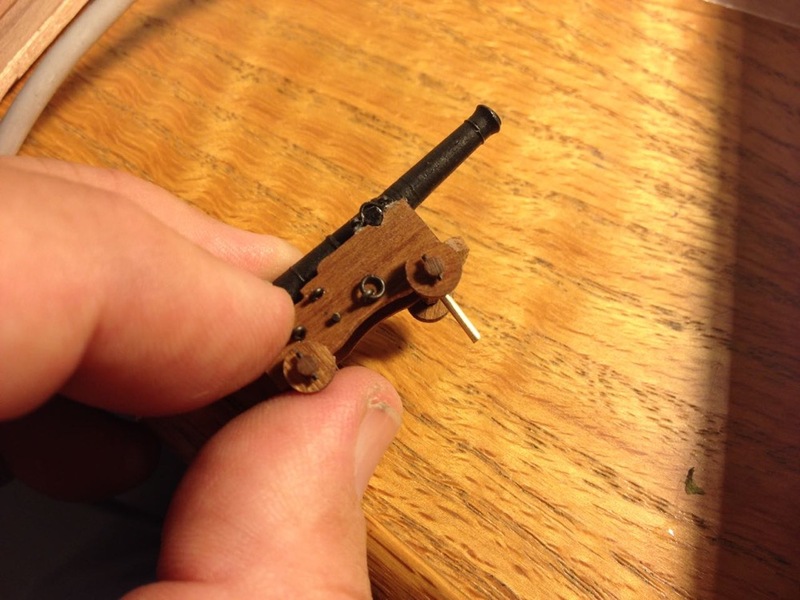 To fix the stanchions in place, I used 1/32″ brass rod for strength. The brass shows through the top of the rail, but I figure that when the brass tarnishes, it will turn brown and then won’t stand out much. Plus, I could help it along a little with some Brass Brown or Blacken-It. 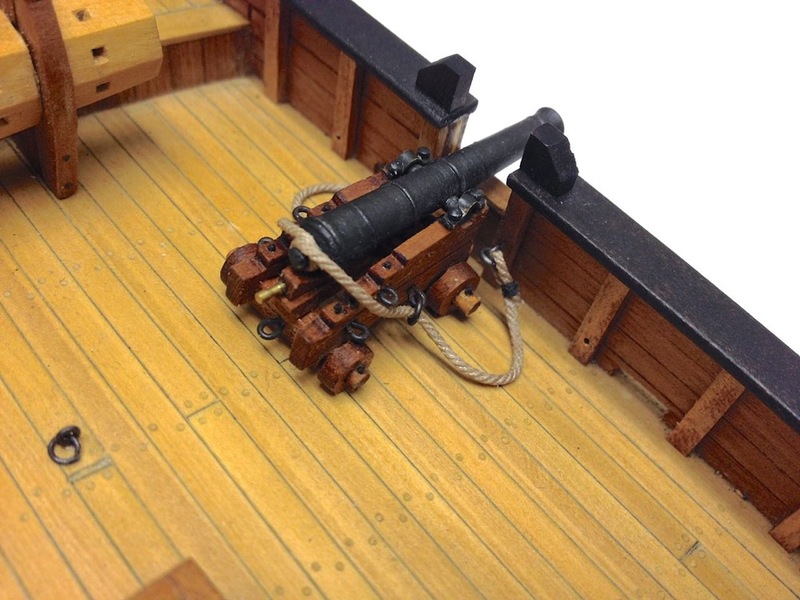 The question about how I wanted to fix the cannons to the deck was easy, as I’d been thinking about this for some time. Commonly, the deck guns are glued down to the deck. But, the only part of the cannon carriage that makes contact with the deck are the trucks, or wheels. This means the glue either shows, or the mounting is a bit weak. 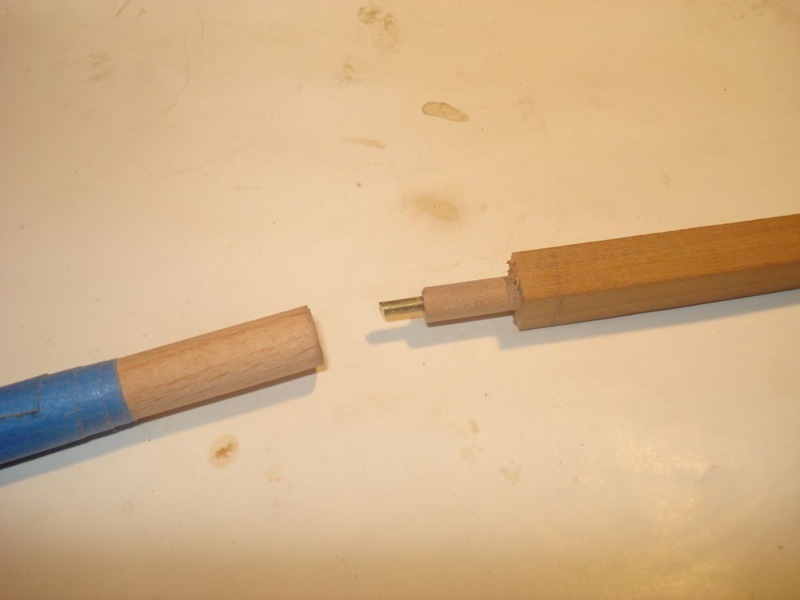 If weak, an accidental nudge of the barrel can knock the whole assembly loose. So, I decided to pin them into place. I considered adding a pin to a pair of the trucks, but thought it would be simpler to use a small piece of brass rod through the front axle. Because this is well under the carriage, it should be pretty well invisible. I drilled corresponding holes in the deck and it looks like that will work fine when I come to permanently installing them, which I will do a little later on. I haven’t done too much more along this line, though I did experiment with using pre-cast bullseyes in the futtock shrouds. However, I never liked how they looked. They were too large, plus they had to be painted on a model that is otherwise pretty well devoid of paint, and just never seemed quite right. 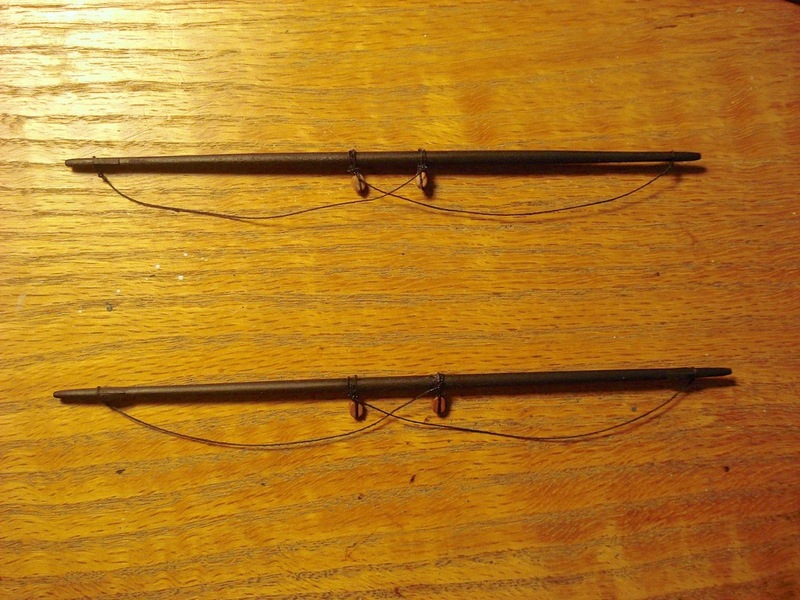 So, I’m going back to the simple wire futtock shrouds that I had started with. Meanwhile, I did take care of rigging the footropes on the yards. It might be questionable as to whether footropes were actually needed on the yards of a small topsail schooner of the period. But, Harold Hahn put them on his Colonial Schooner models, so that’s good enough for me! I used .015″ line for the footropes and stirrups. I pre-made the stirrups, tying the bottom of the stirrups around a sewing pin to form the hole for the footrope. While I try to avoid its use elsewhere in rigging, I used a tiny dab of thin CA to harden the loop. When dry, the pin pops loose without much effort and leaves a nice small hole, which is easy to thread the footrope through. It might not be correct, but for the upper yards, they seemed small enough that I didn’t put stirrups on them, so just put them on the lower yards. The next thing I’m working on, besides fixing the futtock shrouds, is to find the rigging line to use that I’m going to be happy with on this model. I have some different kinds of line on-hand, but I’m not really happy with any of it. I think on this model, I want to use model rope that looks right. I’ve been figuring I’d have to make my own, which I’ve done in the past, but if I do that, then it’s time for me to make a new motorized ropewalk. I’ve done some rope making by hand in the past, but I don’t want to do that any more. I have the plans for a very nice setup that was drawn up by ship modeler Jerry Blair, and I have all the parts necessary. But, that’s yet another project and I’m feeling a bit lazy. So, I’m considering finding the guy who sells the stuff called MoRope. It’s expensive, but looks really good. I inherited some of what I believe is MoRope and it looks awesome, but I’ve never tried working with it. 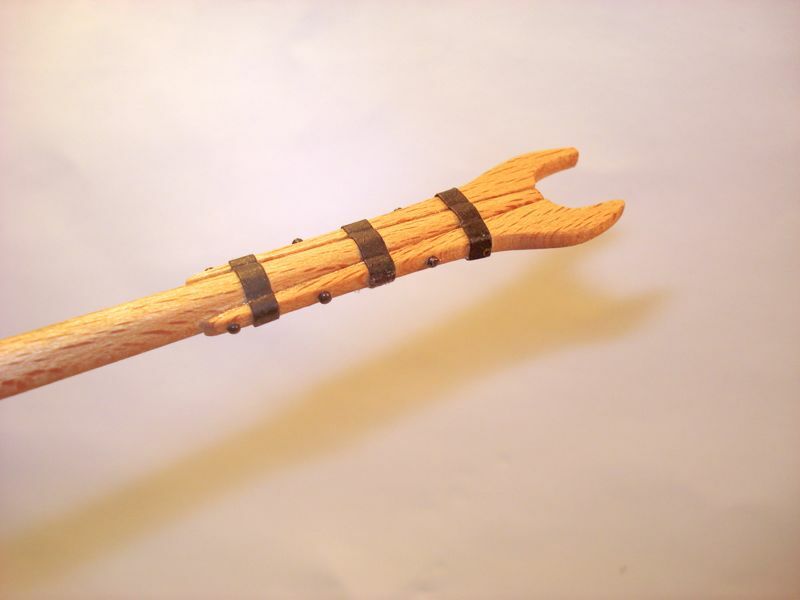 It would be much easier to get model rope from Syren Ship Model Company, which looks really good. But, I tend do notice thinks like z-layed versus s-layed rope, most rope being z-layed, while Syren’s is all s-layed. Aside from that, I still have to figure out what to do about the figurehead. Also, there is a question as to whether I’m going to add sails. I’ve gone back and forth on this. Initially, the idea was to have furled sails. Then, it was going to have no sails. But now I’m thinking about full sails, especially after I recently picked up my model of the privateer Lively from the shop it was in. The sails looked really good the way I had done them. So, I’m thinking again about doing a set for the Colonial Schooner. Sails on my scratch-built privateer Lively. I don’t have to decide on the sails quite yet, but I’m getting awfully close. While I contemplate some of these questions, I’ll be moving forward by making some more cleats. I actually recently started this process and made a batch. 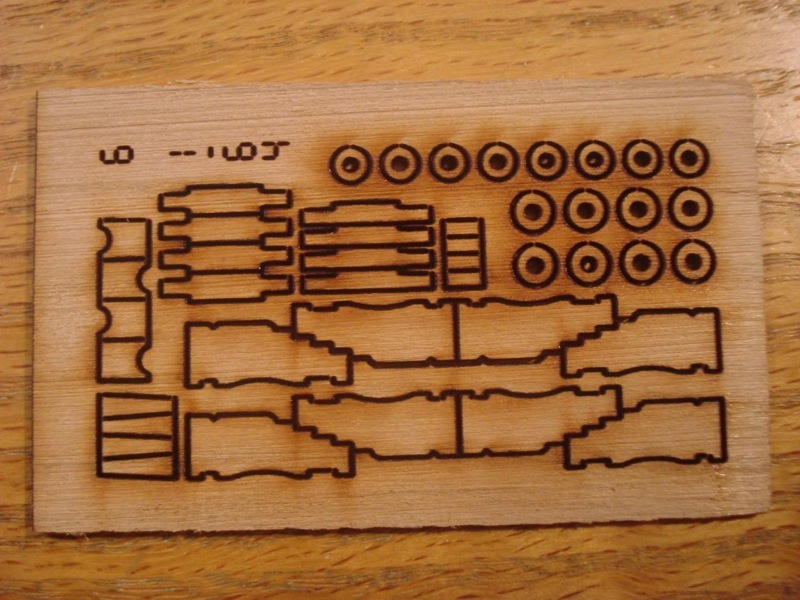 Then, I discovered new laser-cut cleats being produced in a sheet by Syren Ship Model Company. These look really good on Syren’s website, so I ordered some to check out. I’ll post some info about those soon. 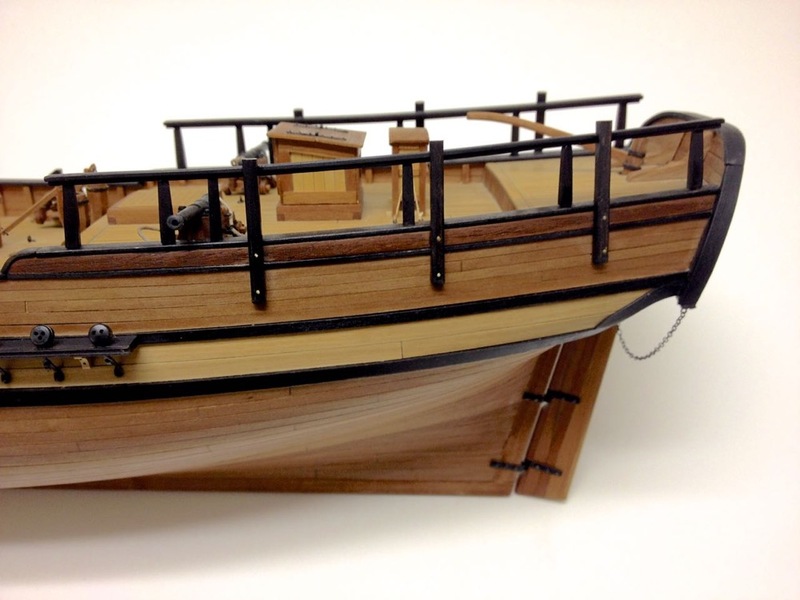 This entry was posted in AL's Independence Build, Ship Model Build Logs, Ship Modeling News and tagged Artesania Latina, Colonial Schooner, Independence, Ship Model Kit on June 1, 2015 by catopower. Progress has been slow on the Independence, as I just have too many diversions. 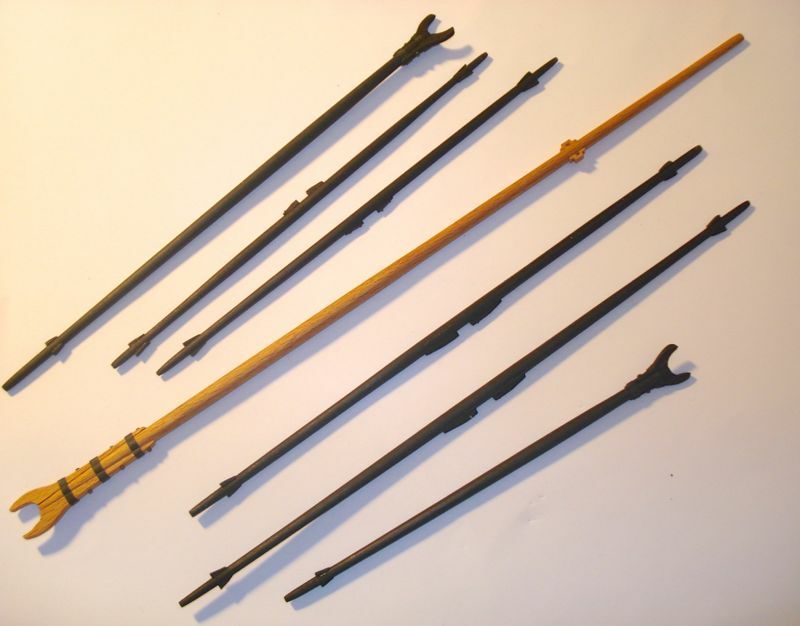 But, it continues and I’ve completed work on shaping and basic detailing of the spars last month. Now, if I were building this model from scratch, I would be working from a set of plans that I trust. Were this the Halifax, for instance, I’d probably be building this from Harold Hahn plans. I would be taking measurements off those plans and trying to stick to rules of proportions for shaping the spars. Since this is based on an Artesania Latina kit, and the size and proportions of the objects on the plans are questionable, I struggle a bit, then end up shaping things by eye. 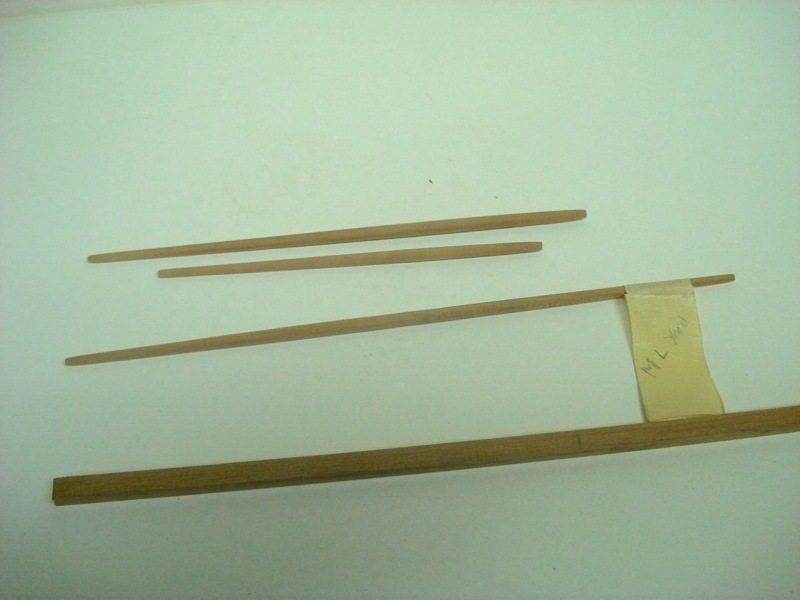 That is, I’ll try to start with spars that look right to me and then shape they so that they look right. I don’t really measure here except to keep them symmetrical or to just verify the exact shape I’m seeing. As with everything in this kit, I didn’t use the provided dowels. Instead, I have some pear wood on hand for those spars that will be died black, and I have some beech wood for those that will remain natural in finish. It doesn’t have to be this way, but I decided that the main boom will be the only spar with natural finish for its full length. 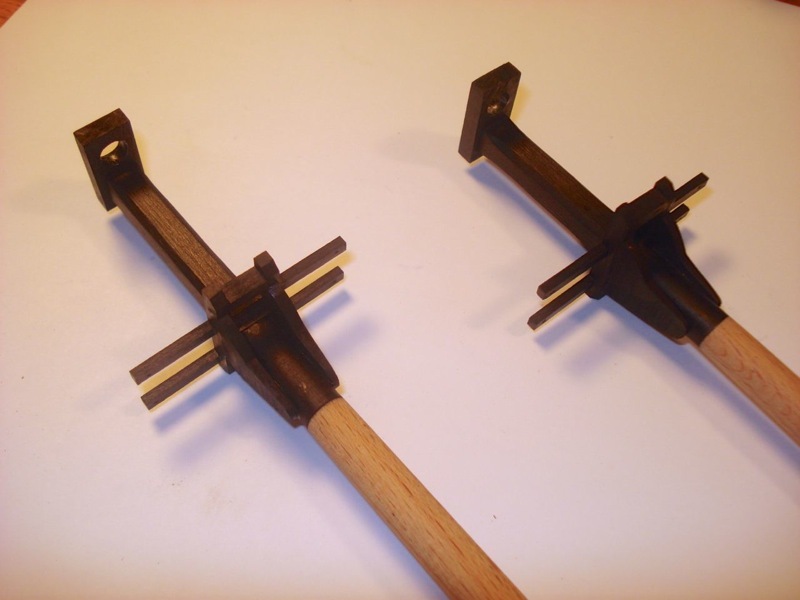 The yards and gaffs will all be dyed black the same as the other black wood on this model, using Fiebing’s black leather dye. I don’t know if I’ll necessarily build a model this way in the future as pear wood is a bit “bendy” and it doesn’t seem quite as stable as I’d like. But, rigged, I think it will be fine on this model. Certainly, the beech wood is stiff and strong, so I don’t see any issues there. In all cases, I started with square stock wood, usually that way because I just cut it from sheets I have on hand. I try to use a small plane to take the square cross section down to octagonal and beyond. But then I chuck the piece into the end of an electric drill and use 100 or 150 grit sandpaper to sand it round. I’ll add an appropriate taper by eyeballing it, switching to maybe 220 grit sand paper to finish the sanding. For the masts, I ran into an issue with my paint-free plan. The dye works well on pear wood, but not so well on other wood. Also, It was important for the dye not to bleed, so I tried a new approach. I made the area of the mast doublings out of pear wood, with the natural sections of the mast in beech wood. 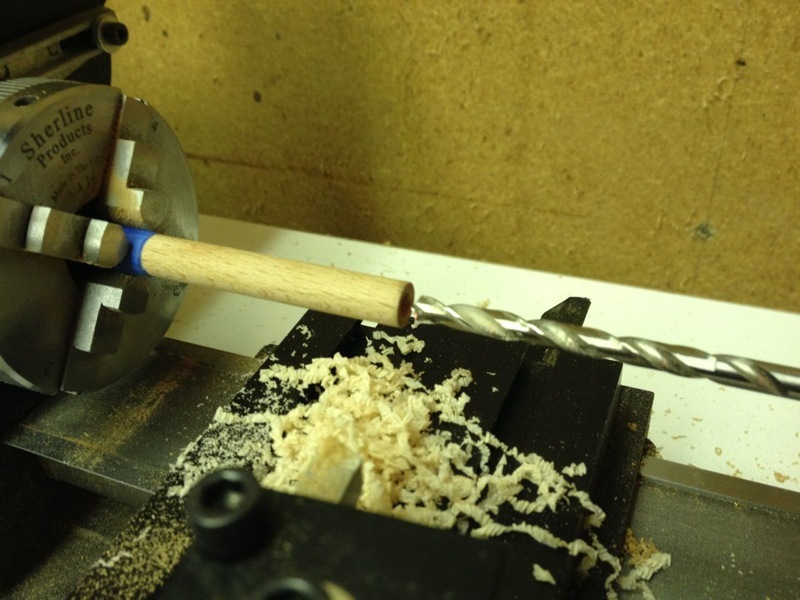 I drilled out the beech wood dowel using a center drill bit on my lathe and then turned a piece of beech wood down so that it had a peg to fit into the hole. In the process of putting them together, I’d ruined of the first of the mast dowels. 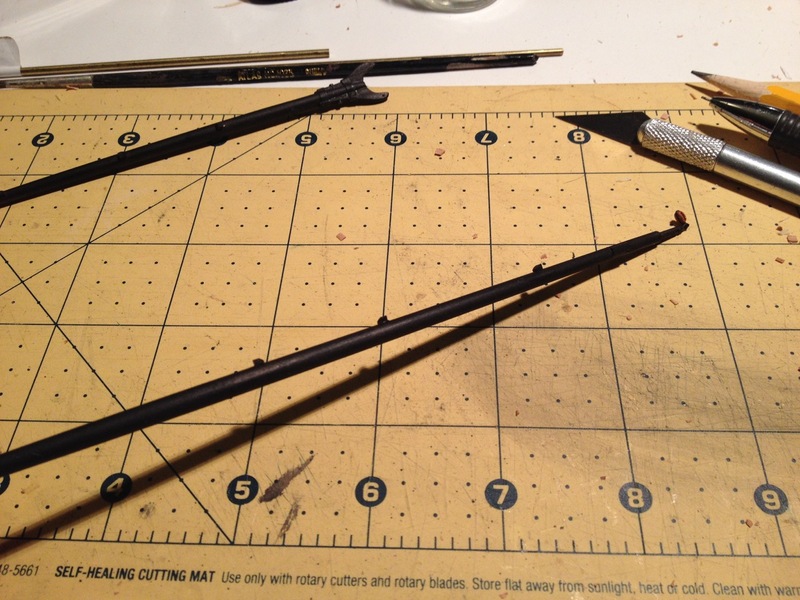 So, I redid them with a piece of reinforcing brass rod inserted for strength. I made the decision a while back to rig this schooner with both fore and aft square topsails instead of just the fore topsail as provided in the kit. That topsail is also quite broad and I’m using Hahn’s Halifax drawings to get a better looking topsail size, which are noticeably narrow and look much nicer, I think. For detailing the boom and gaffs, I added the jaws at the throats and I simulated iron bolts using stainless steel pins blackened with Caswell’s Stainless Steel Blackener, which I’ve found works really well on real stainless steel and it worked great on these pins. For the iron bands with wrap and secure the jaws to the spar, I went the old fashion method and cut some very thin strips of black construction paper and glued it in place with some Elmer’s white glue. Worked beautifully without the need for brass soldering. In order to maintain some progress momentum, I also started adding blocks to the mast tops. For this, I went back and forth a bit as to what brand of blocks to use, but ended up settling on Swiss Pear blocks from Syren Ship Model Company. These are really beautiful blocks and they looked even nicer after I treated them with some Watco Danish wood oil. I used Natural, which just brought out the nice color of the pear wood. The one thing that I’m not entirely happy with regarding Syren’s blocks are that the sizes go from 1/8″ to 3/32″ with nothing in between. This might not seem like an issue, but I find that there’s a pretty big visual difference between these two sizes. These two are roughly 3mm and 4mm. Now, blocks from Warner Woods West come in 3mm, 3.5mm and 4mm, which really provides a nice gradual transition in sizes, but not Syren. 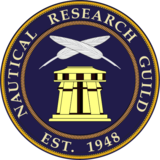 I’ve mentioned this to the owner, Chuck Passaro, who is also an incredibly talented ship modeler, but he claims that there hasn’t been any demand and there are plenty of other products that needed his attention. For this reason, I actually upped some of the the block sizes I used in order to avoid what I felt was a visual discrepancy, relying more on 4mm blocks where I would have otherwise used 3.5mm blocks. This entry was posted in AL's Independence Build, Ship Model Build Logs, Ship Modeling News and tagged Artesania Latina, Colonial Schooner, Independence, Masting, Spar Making on March 27, 2015 by catopower. Been making slow progress on the Independence, having been spending some extra time on other projects. But now it’s time to stop dragging my feet and to put in the work on this model! 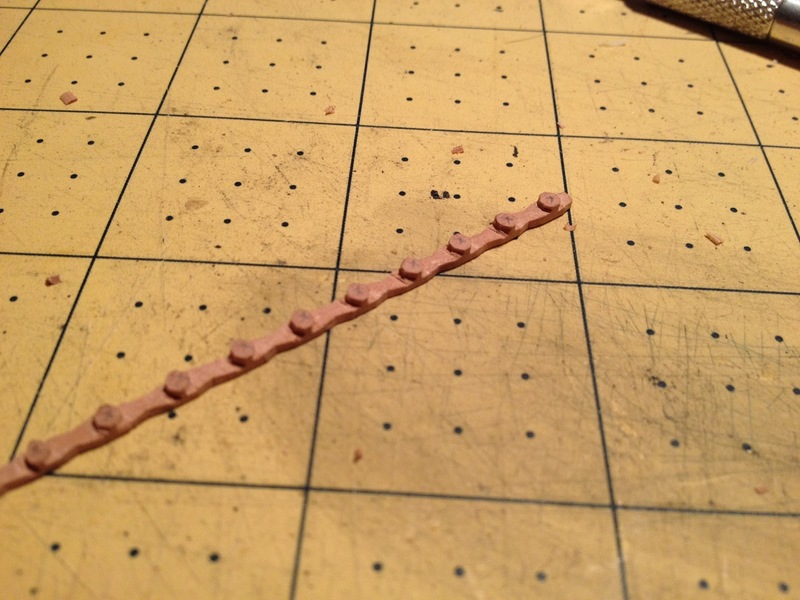 To begin with, I spent a lot of time over the past few weeks making lot of rings, eyebolts, and hooks, so I could start mounting blocks on the model. I added some ringbolts to the deck for rigging the cannons, but mostly I worked out the locations of the rigging blocks that will be attached to the masts and got those into place. Note that it’s actually easiest to strop the blocks directly onto the eyebolts and THEN mount them onto the model. Something I kind of forgot in my haste to get these things in place. So, I actually removed some bolts that I’m going to be adding blocks to and I will glue the eyebolts back into place once those are done. I may do the same with some of these as well. 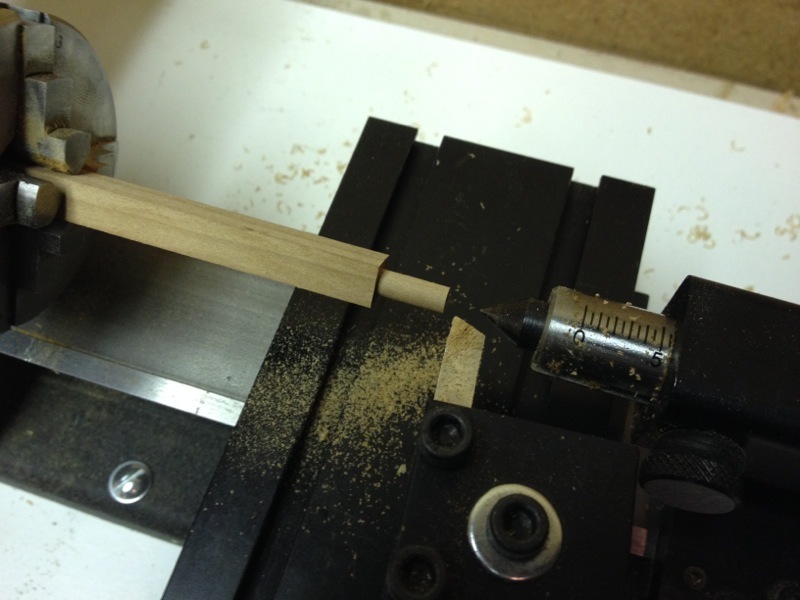 I also made some knees using a rectangular cross-section strip of boxwood that I ran through my router table. I then cut the individual knees from the strip – like cutting slices from a loaf of bread. I used these under the catheads and also under the channels. On a ship as small as this, I don’t know if there really would have been a need for knees under the channels, but I don’t they are out of place, and they add some more visual detail. 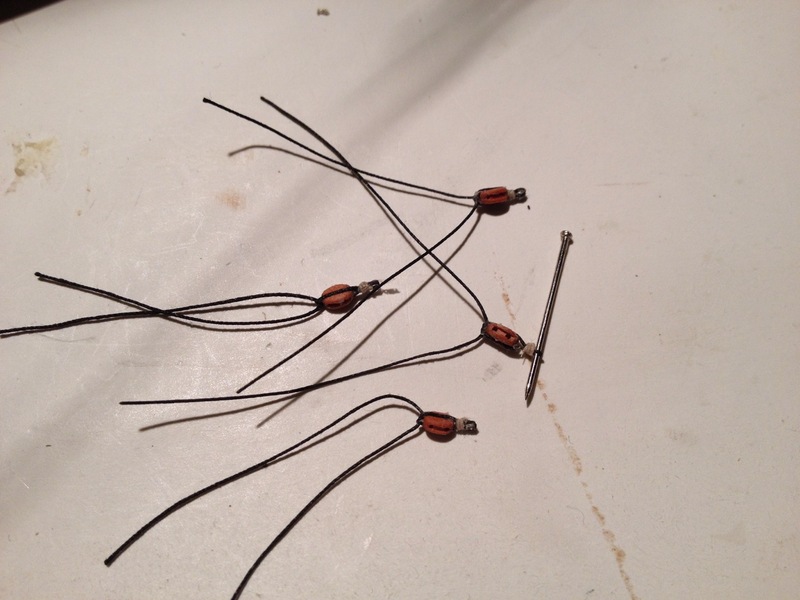 I drilled these knees out and used short pieces of blackened wire to simulate bolts. They aren’t actually pinned to the hull as the wire is very short and only for appearance sake, but they make for some easy visual detail. Another detail that I’d been taking my time planning out were the timberheads that stick up over the cap rail at the bow. I just used boxwood to make these. I had been wrestling with the dimensions, layout and appearance of these and finally settled on what you see here. These needed to line up with the timberheads that line the bulwarks interior, though you might notice the change in color from the cherry wood at the bulwarks to the boxwood above the cap rail. Were I to do this all again, it would have been easier to have a completely closed, planked bulwarks, or I would have gone with wider timberheads and maybe simple use cherry for these pieces on the cap rail. In the above photo, you can also see that I’ve added some of the cleats I made earlier. In this case they are mounted at the foot of the catheads. Next thing was that I finally worked out the design of the deck pumps. 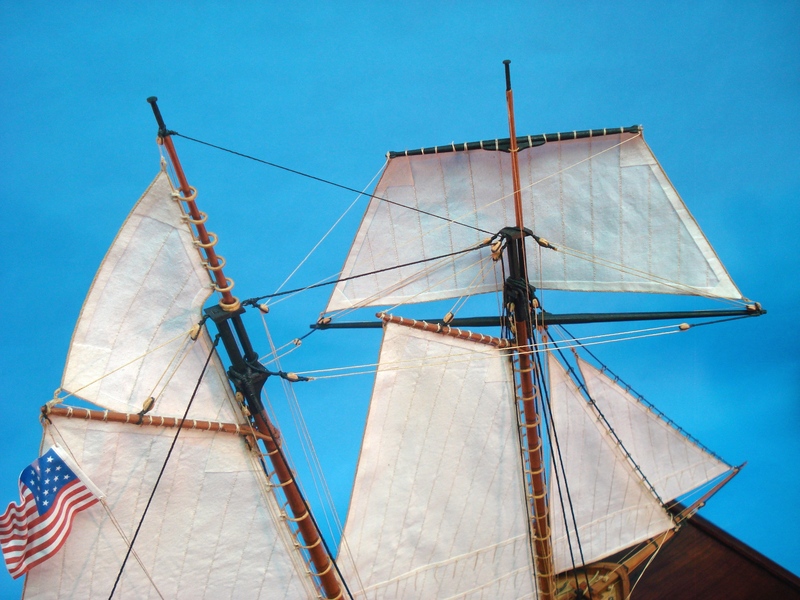 These are similar to designs shown in Hahn’s book The Colonial Schooner. 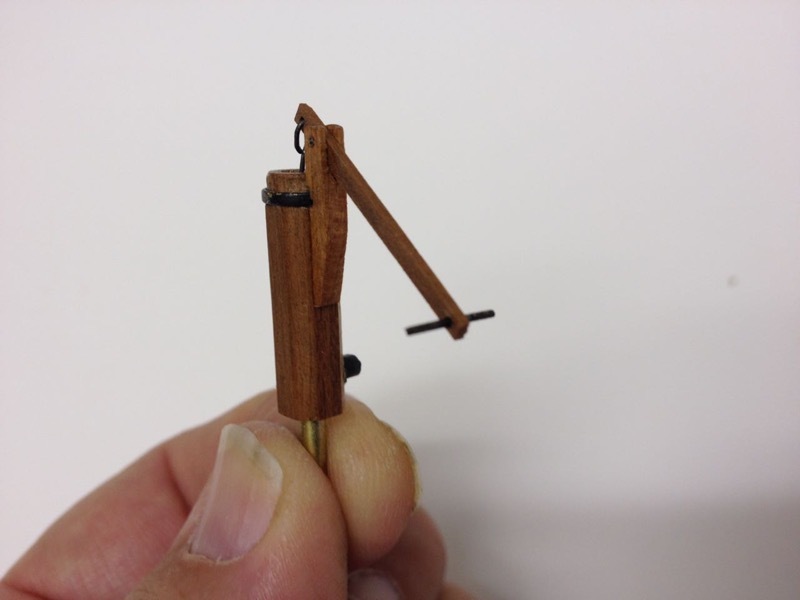 I looked at photos of pumps with metal yokes, but opted to keep it simple and made mine from wood. But the pump handles are perfectly straight like he shows and because of that, they tend to stick out a bit. Problem was that I couldn’t then situate them where they’d be out of the way, and I ended up having to relocated the ladders about 1/2″ outboard of where I originally placed them. Since I pinned the ladders to the deck, this left a pin hole. I felt it best to just stick some eyebolts in the holes. They are pretty well out of the way and close enough to the mainmast and main boom that they might actually be useful. Even if unused, they would not look out of the ordinary. Later I finished up the deadeyes and chainplates and so added the channels into place. I also decided to follow a lead from Hahn’s work and added an accept plank. I had run across a sale on Peruvian Walnut boards when I went to Rockler woodworking one day and bought one. I’d been looking for uses for this stuff which is very dark. It is also a little on the soft side and the grain is hardly noticeable. I decided to cut a couple planks and shaped them to fit the upper most strakes of the hull, just beneath the cap rail at the quarterdeck. This gives a nice, rich-toned color accent to the model that’s just a bit of artistic flair. 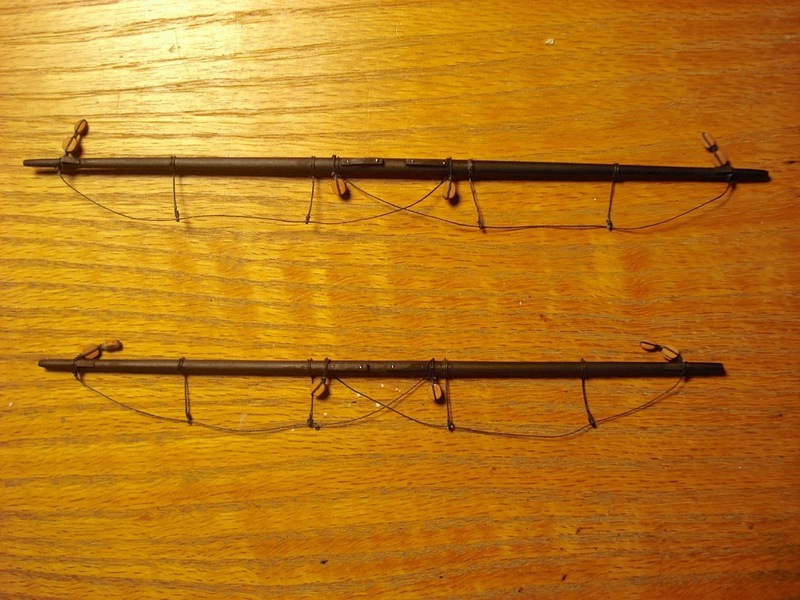 I might also use some on the large, rather plain looking transom to add some interest there. Lastly, I haven’t been very happy with the look of the stern gallery lights and finally took on the task of ripping them out. I’ll rebuild them with thinner framing material, fewer panes, and I’ll cut and fit a piece of acrylic to back them as well. I just have to remember what I read to glue them up with so that the acrylic isn’t smeared or damaged. 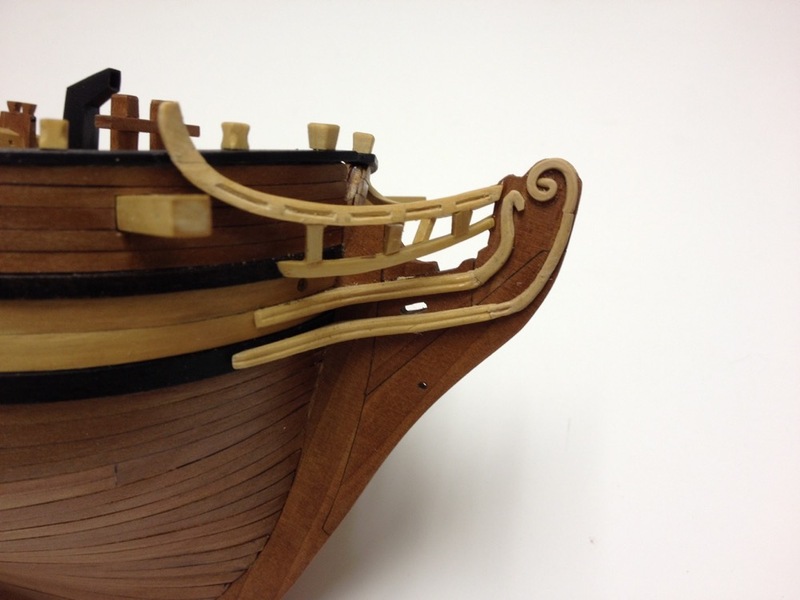 This entry was posted in AL's Independence Build, Ship Model Build Logs, Ship Modeling News and tagged Artesania Latina, Colonial Schooner, Independence, Ship Model Kit on November 8, 2014 by catopower. In my last post, I wrote about the cannons and carriages I purchased from The Lumberyard for use on the Colonial Schooner Independence. Since then, I’ve assembled a whole new set of carriages and added a number of details in the process. Specifically, I’ve added the carriage bolts, trunnion locks, ringbolts, eye bolts, and various other bolts, added quoins (the blocks used to hold the cannon in proper elevation, and axle pins. The job isn’t perfect, but it was my first attempt at detailing gun carriages, and for this model, I think they’ll work out rather well. 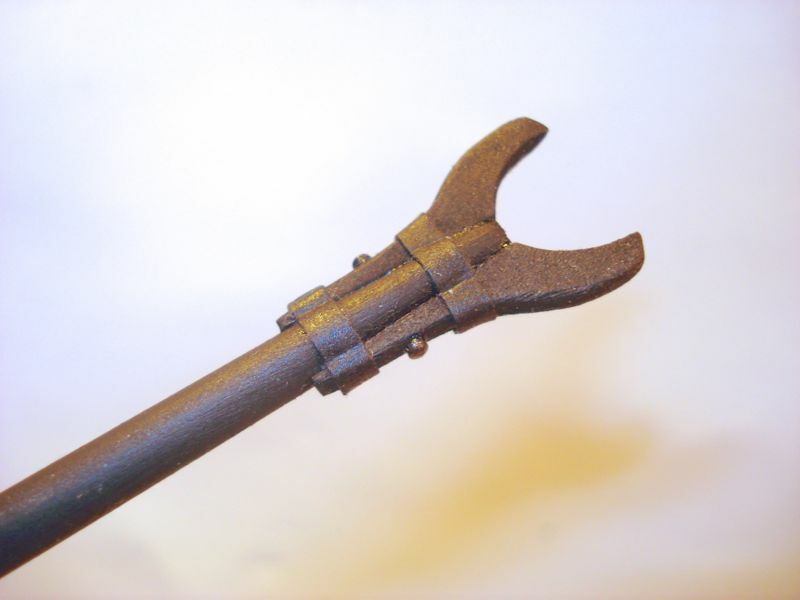 All the additions were hand made with the exception of the handle for the quoin block, which is simply a small belaying pin – BlueJacket part number 119. I left it bright brass figuring that it will tarnish soon enough, turning a yellowish-brown. The trunnion locks were made from brass strip, but everything else was made from steel wire or steel pins. 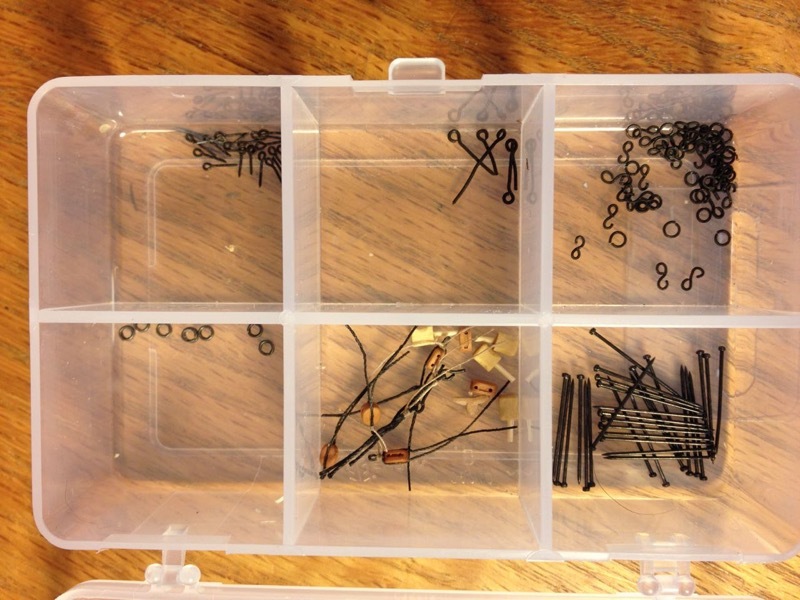 The ringbolts were made from 24 gauge black annealed steel wire. If you recall a few posts back, I discovered a product called Stainless Steel Black from a company called Caswell. Well, this stuff worked great on all the metal parts shown here, though I used BlueJacket’s Pewter Black metal toner for the cannon barrel, though I did then coat it with Caswell’s sealer that came with my stainless steel blackening product. The axles were a bit tricky to drill out for the pins, but it just took some care and the using up of one of the spare carriages. A few months back, on the recommendation of a fellow ship modeler (a VERY good one) I bought one of those cheap mini drill presses that showed up en masse on the Internet about a year ago – the green ones with the variable speed dial and imported from China that retail for under $70. 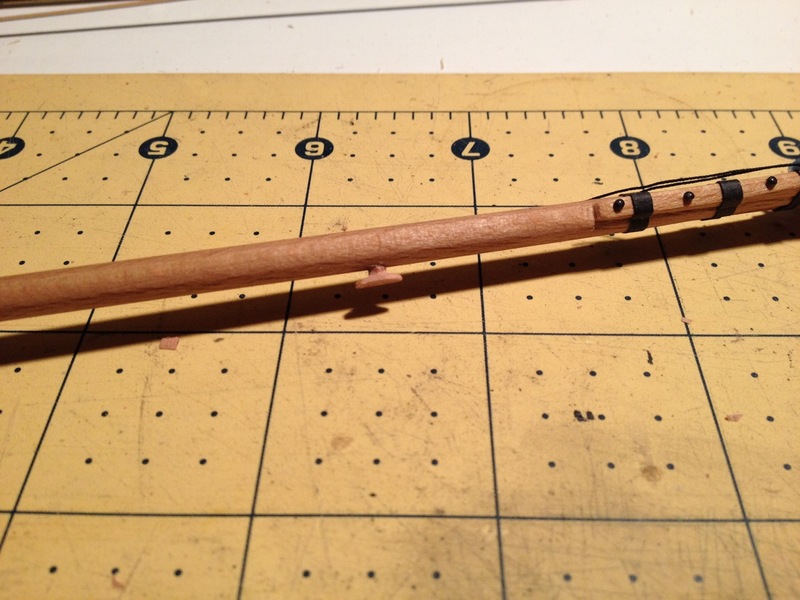 Works very well, I must say, and I used this with a #73 drill to make the holes in the axles. Anyway, it took quite a number of hours to do all the work on the cannons. It kind of surprised me at how long it took to do the work, but it shouldn’t. Lots of steps, but they came out looking pretty nice – Even more so when they’re on the deck of the ship. This entry was posted in AL's Independence Build, Ship Model Build Logs, Ship Modeling News, Shop Notes and tagged Artesania Latina, cannon carriages, cannons, Colonial Schooner, Independence, ship model fittings, The Lumberyard on May 31, 2014 by catopower. 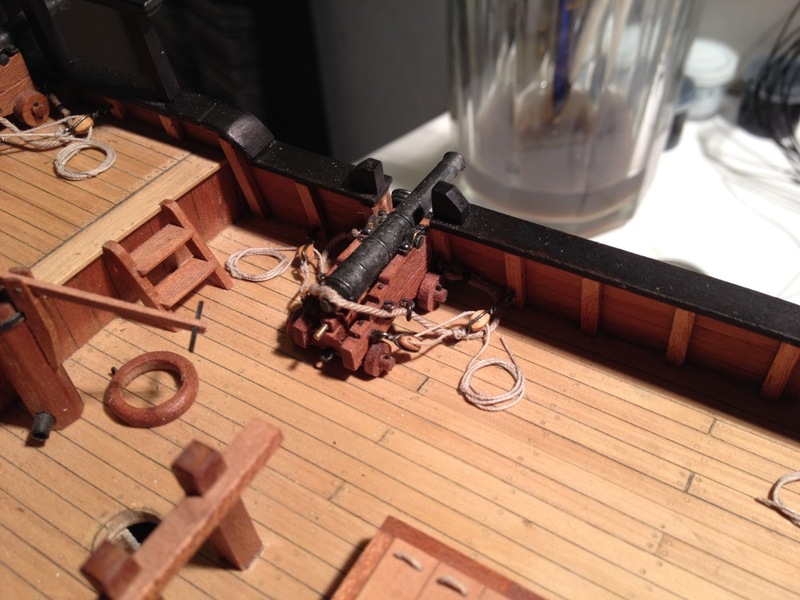 For my Colonial Schooner model, I really didn’t like the quality of the cannon barrels provided. They’re turned brass, but they hardly resemble anything that looks real cannons. 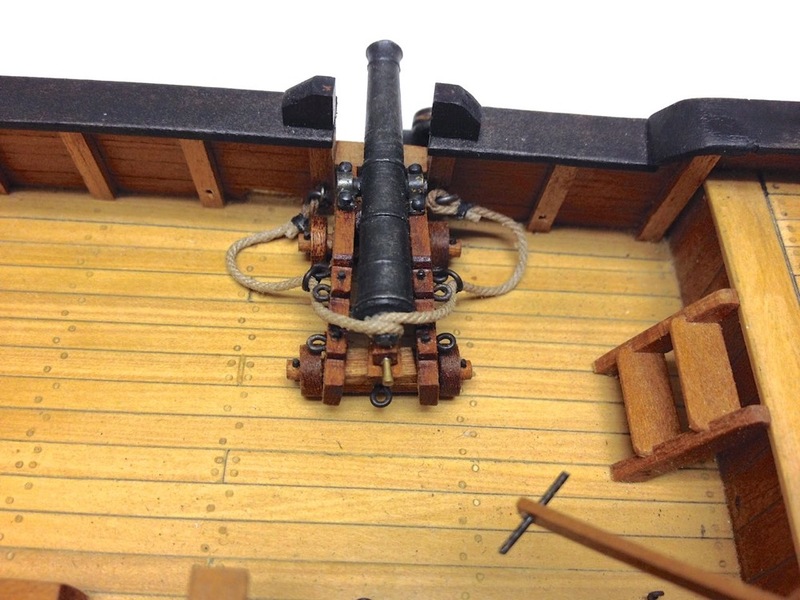 Various kit manufacturers make cannon barrels, but usually the selection is very limited and, often times, the accuracy of detail still leaves much to be desired. Luckily, there is The Lumberyard for Model Shipwrights. The Lumberyard is best known for providing wood for ship modeling and for the timbering sets they sell for Harold Hahn style models. These are the somewhat stylized, framed, scratch-built models that are constructed inverted on a building jig. The Lumberyard’s sets include the plans, all the necessary wood in a mix of species, a laser cut building jig and a selection of important laser cut parts. But, when it comes to cannons, The Lumberyard has a nice selection in both cast britannia pewter and CNC turned acrylic. 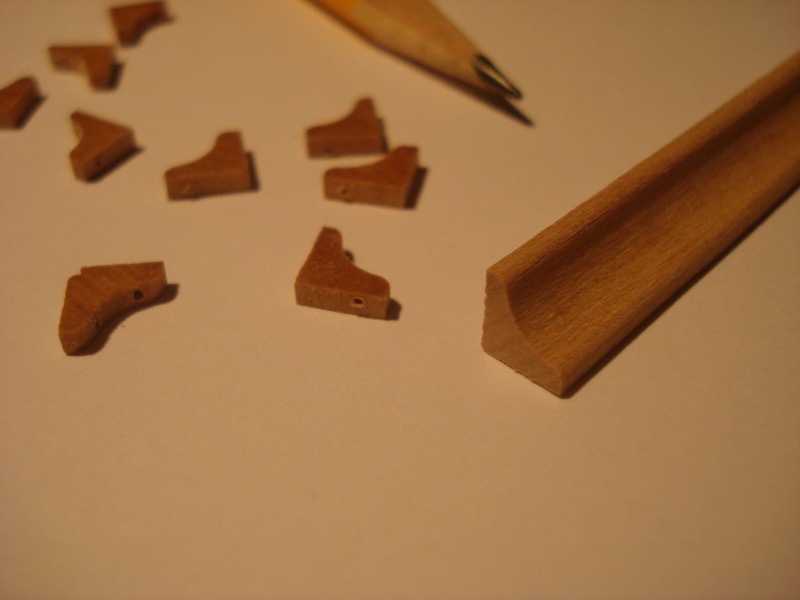 The company also carries laser-cut gun carriages that come in sets of four on a sheet of cherry wood. 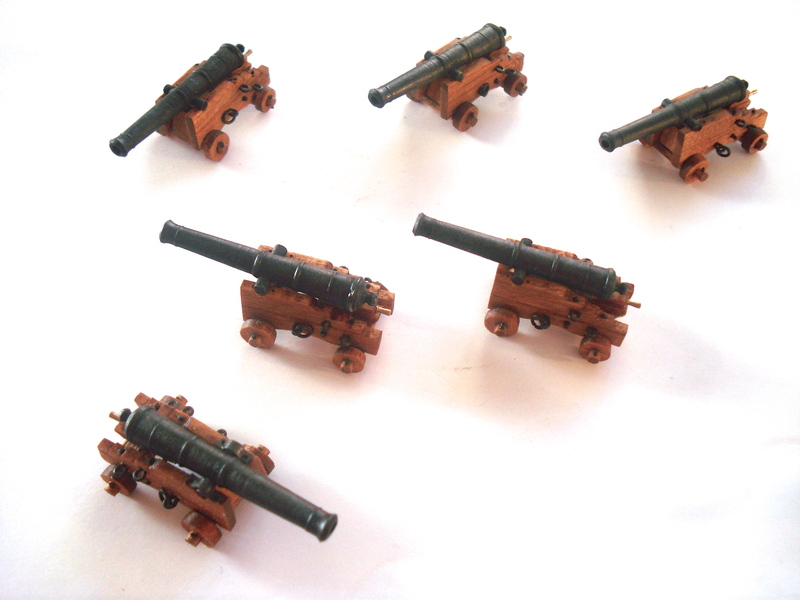 Cannons and carriages are identified by the poundage of shot and model scale. Unfortunately, the product line is limited to 3/16″ = 1′ (1:64) and 1/4″ = 1′ (1:48), and not all shot sizes are available in both scales. But, even if you’re working in other scales, you might be able to find something that will work for you. I haven’t purchased the acrylic cannon barrels, but I have ordered several of the pewter ones and they’re pretty nice. The trunnions are cast below the centerline, which is very nice. The barrels come slightly blackened, looking somewhat grayish. I used a product called Pewter Black that BlueJacket sells and that made them black black. The trunnions themselves are long, allowing you to file them down to fit whatever carriages you’re using. The casting detail is good, but I wish that whoever is doing the actual casting was able to not compress the molds so much as the barrels you get are sometimes noticeably flattened. With some castings, this is more apparent than others, and the first set of 1/4″ scale 1/2-pounder swivel guns I bought looked like “road kill”, but ones I’ve gotten since are considerably better looking. Anyway, given The Lumberyard’s customer support, I think they’d happily replace them if you have a problem with them. As for the gun carriages, which are sold separately, these are very nice. The main problem with them is that the builder is apparently expected to provide his or own set of construction plans as none are included with the carriage sets. But, all gun carriages are pretty much the same, so once you’ve built one, you’ll have it figured out for the next time. I’m not sure about what period these carriages are supposed to represent or what nationality, but the 6-pounder carriages I bought for my Colonial Schooner seemed a bit on the large size for the barrels. Still, compared to what was in the kit and to available alternatives, they look pretty darned good. The Lumberyard’s cannon carriages come 4 to a sheet. Overall, I think The Lumberyard is a good source for your naval artillery needs. Just be patient with the shipping. I don’t know if they have a supply of them in-house or if they make them as they’re needed or if another company makes the barrels for them, but it can take a couple weeks to get an oder shipped from The Lumberyard, so you just have to be a little patient and order in advance of your needs. 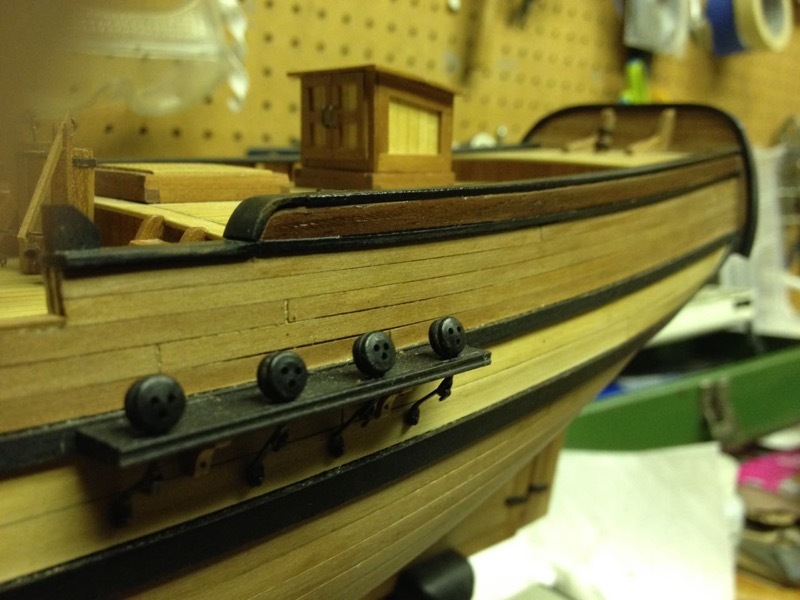 This entry was posted in AL's Independence Build, Product Review, Ship Modeling News, Shop Notes and tagged cannon barrels, cannon carriages, ship model fittings, The Lumberyard on May 21, 2014 by catopower.